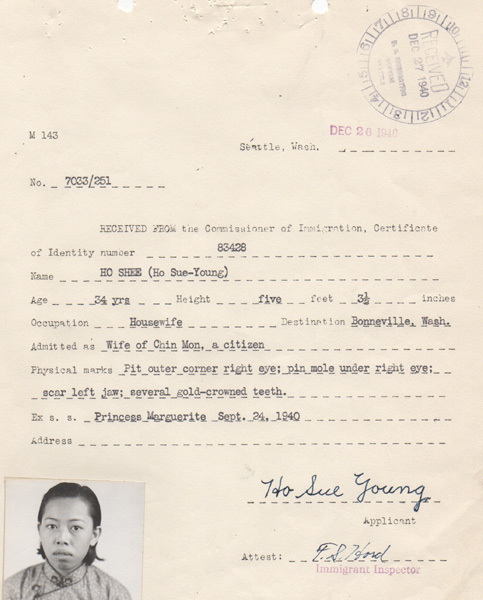 “Ho Shee (Ho Sue-Young), Photo, Precis of Investigation, 1940“ Chinese Exclusion Act case files, RG 85, National Archives-Seattle, Ho Shee case file, Seattle Box 1015, 7033/251. This week’s blog entry is by Darby Li Po Price. He researched his family in the Chinese Exclusion Act case files at the National Archives-Seattle and found many family files. This file is for his grandmother and her family. 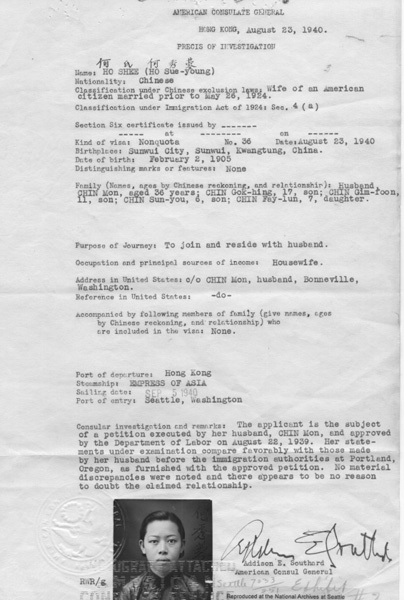 Ho Shee (Ho Sue-Young)’s Precis of Investigation, issued in 1940 by the American Consulate in Hong Kong, permitted Ho to travel to Seattle with two children to reside with her husband Chin Mon in Bonneville, WA. Ho’s Seattle file no. 7033/251 also includes Mon’s petition for Ho’s immigration visa, a Pre-Investigation of status of citizenship interview of Mon, interviews of Ho, Mon, Sun-You, and Fay-lun conducted in Seattle, Summary for admission, and Ho’s application for Certificate of Identity. Interviews spanning 22 pages describe Ho, Mon, and other family in China and the U.S. Their marriage in Sun Wui Village (Xinhui) was arranged by their parents and a go-between woman in 1922. Ho and Mon did not meet until their marriage ceremony 1 June 1 1922. A few months later, Mon immigrated to North Bonneville, WA and became owner and operator of the Kong Chew Restaurant. Ho lived with Mon’s mother in China the next 16 years. Mon returned to Sun Wui November 1928-April 1930, and April 1932-May 1934, and bought a brick house at 32 Ng Ming Chung highway for Ho. Ho, Sun-You, and Fay-lun lived in Hong Kong from 1938 until their 1940 immigration. When they left Hong Kong, Japanese planes strafed their ship and they had to duck for cover. Sun-You (Johnny) was adopted by his godfather, Jack Lee, in Portland. Ho was born 28 December 1904 in Sun Wui to her mother Lum Shee, and father Ho Hon Jone. Ho spoke the See Yip (Siyi) dialect of Sun Wui. Mon, despite growing up in Sun Wui, spoke Yip Wui Ping dialect because in the U.S. he had mixed with Hoi San and Hoi Ping speakers. 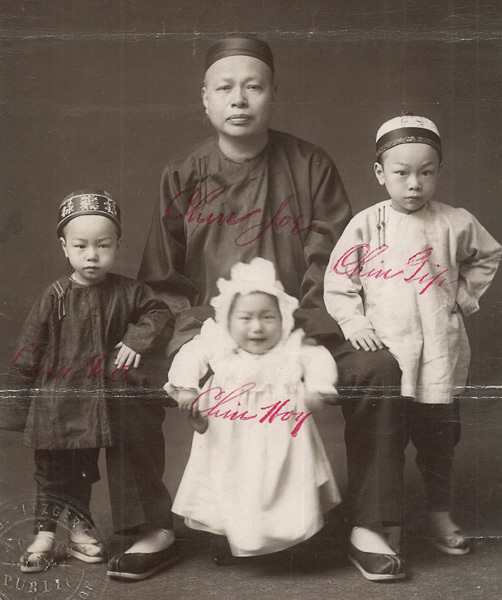 Mon, born 28 February 1904 in Sun Wui, lived with his mother, Tom (Hom) Shee, born 1880 Sun Wui, until entry to Seattle 1922 as the oldest son of Chin Jan (Yock Kong), a citizen by 1881 birth in Portland. In 1939, Jan was a cook at the New Cathay Cafe at 82nd and Division. Mon’s mother was Hom (Mock) Shee. Jan’s parents were Chew (Joe) Chin, and Leong Shee. Mon’s siblings were: Soon, On, Quay, Wing, Hoe, and Kin. Jan’s brothers were: Quong, Jip, Choe, Hoy, Hom; sisters: Sing Choy, and Lin Choy. Ho and Mon claimed two other sons: Gok Hing (George), born 1923, entered Seattle 1934 with Mon, then lived with Wong On, owner of the Hung Far Low Restaurant, 112 NW 4th Ave., Portland. Gok Hing (George)’s mother (whom stayed in China) was the sister of Wong On’s first wife Yee Shee. Gim Foon (Kim), was born 1929 in Ark Hing Lai, Kwangting by Mon’s first wife, whom Mon left after an affair with and impregnating her younger sister, Ho. Gim was in the care of Mon’s cousin Chin Gong (Young Yuke Jee) owner of the Kwong Ching Chong store, Hong Kong until 1941, when due to Japanese invasion he was sent to Gow How, Hoy (Hoi) Ping District to reside with a friend until returning to Hong Kong 1948. He entered Seattle in 1951.